Oh no, it is Labor Day, the last summer holiday! I am going out kicking and screaming! I do not want summer to end, it’s a tragedy. I will miss all of the fun barbecues, picnics, swimming, sun bathing, the boat rides, so sad. I am getting teary eyed just thinking about this. But at least in NYC we will still continue to have summer weather for at least another week, hopefully many more! So it is the last summer get together and you want to bring something to that party that not only tastes great, looks beautiful but something that can withstand the heat. I present to you…my Orzo Pasta Salad. This colorful beauty is not only pretty to look at, it is also healthy, loaded with vitamin C and it will withstand that heat. Why? No mayonnaise. 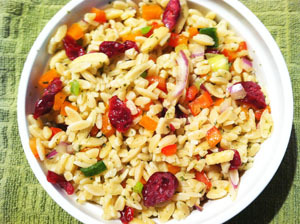 Who cares if it is 80 or 90 degrees outdoors, your pasta salad will stay fresh. I recommend you prepare this the night before to allow all of the ingredients to get happy together, or at least several hours ahead and allow it to get cold in the fridge. So, until we meet again, be safe, eat well and as always, Enjoy! Bring a small pot of salted water to boil. Add the pasta and cook for 9 minutes. Drain. In a mixing bowl add all of the above ingredients with the pasta and mix well with a fork to incorporate all of the ingredients.